Churro Bites are a Disneyland Inspired treat that will take you right back to the park. Crunchy on the outside, soft inside, it’s cinnamon & sugar goodness. Do you love churros? We are obsessed with them in our house. 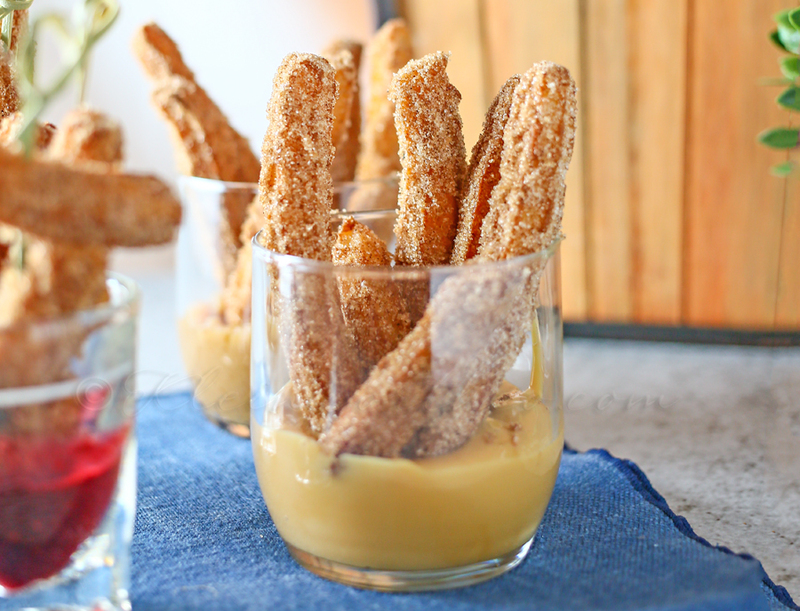 So it should come as no surprise that it isn’t unusual for me to whip up a batch of these Churro Bites to satisfy the craving when it strikes. They are so good. I have told you all that I’m a So Cal girl. I grew up about 10 minutes from Disneyland. Up until I moved away from Orange County, Disneyland was a weekly occurrence for me. I marched in the parades there for years. I sang with my choir there multiple times per year. It was our place to go – even if just for dinner & to catch a couple rides on a slow Tuesday evening. We could see the nightly fireworks from my house. I grew up with them all the time – 9pm. I went to Disneyland for my birthday every single year & celebrated numerous other occasions there. It is ingrained into my soul & will always be dear to my heart. Since it’s been a while since I have visited I have been craving my favorite Disney treat- Disneyland Churros for a while. 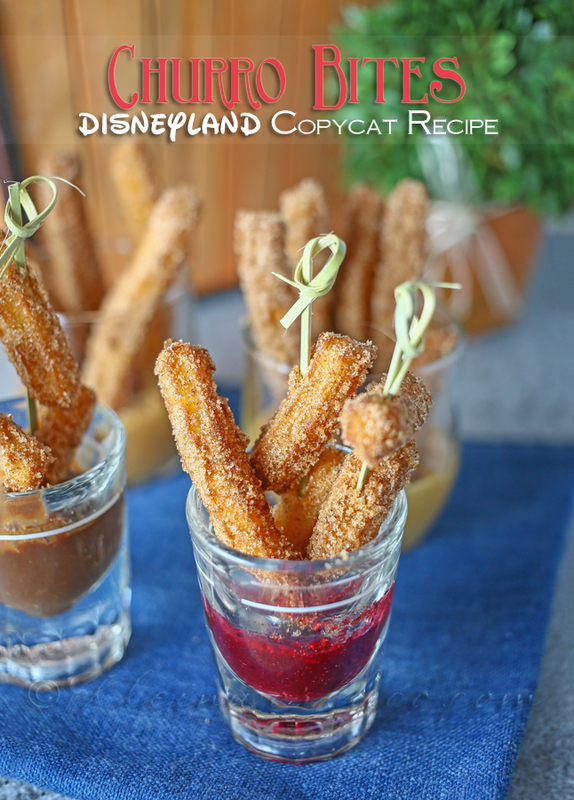 So I would love to recreate them & these Churro Bites ~ Disneyland Inspired Recipe turned out great. The smell of cinnamon & sugar drifting through the house had everyone coming in to see what I was up to. Normally one would make these with the ultra-large 1-1/2″ star tip on the piping bag. That would result in the regular Disney sized churros. Well – I thought for sure in all the mountains of cake decorating supplies I brought back home from my mom’s- that I had that exact tip. Apparently, I do not- so I used the 1″ instead. Made for a smaller churro diameter. They still taste just as good as I remember – always best while still warm. Can I make this recipe into regular sized churros? Absolutely. Just make the dough the same way & use this larger, open star tip & cook them a lot slower. The outside will burn before the insides are cooked because of the size if you don’t go low & slow. Which is why we really love these bites instead. What do I need to make churros? To make churros – you will need a pastry bag, pastry tip & of course your large bowl for mixing the dough, saucepan, large-shallow stockpot or dutch oven & strainer. 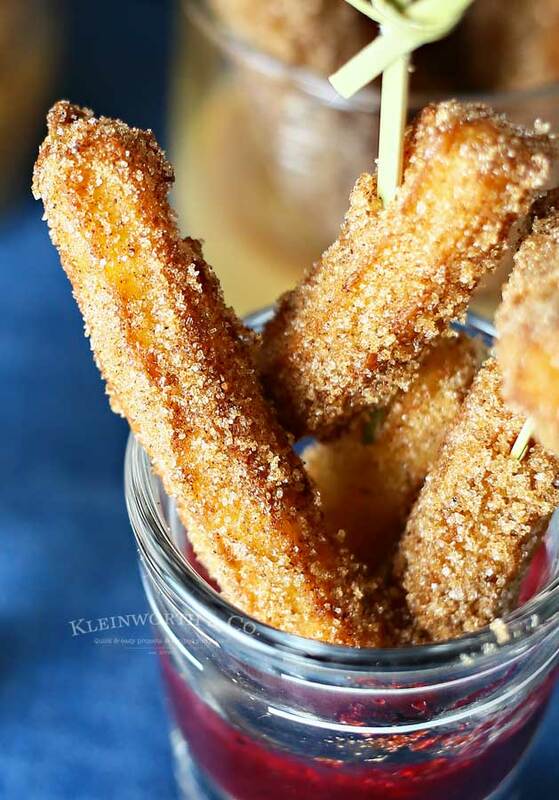 HOW DO YOU MAKE Churro Bites? In a small mixing bowl, whisk together 1/2 cup granulated sugar and cinnamon. Set aside. Heat 1-1/2 inches of oil in a large pot over medium heat to 360 degrees (Watch this closely – through the entire cooking process – important to maintain your temperature). In a separate medium saucepan combine milk, water, butter, 2 tsp sugar, and salt and bring mixture just to a boil. Once boiling, remove from heat and immediately stir in vanilla and flour. Stir together with a spatula & smooth any lumps. Stir until mixture comes together and is smooth. Transfer to a piping bag fitted with a large open star tip. Pipe 2-4 inches of dough out into the oil. Cut dough & to allow the dough to drop into oil. I recommend working in small batches as the dough likes to travel in the oil & come together. 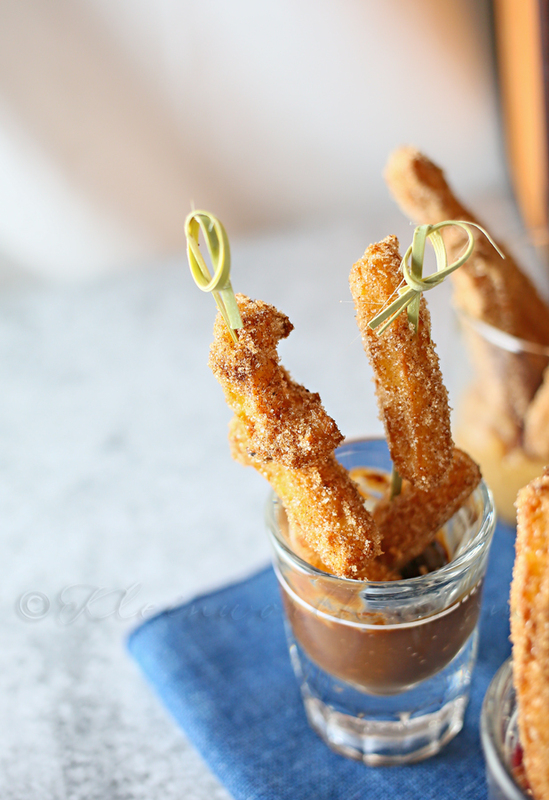 Allow churros to fry until golden brown – remove with a wire strainer. Drain on a wire rack for a couple of minutes. Toss warm, drained churros into sugar mixture to evenly coat. Serve warm with dipping sauce if desired. 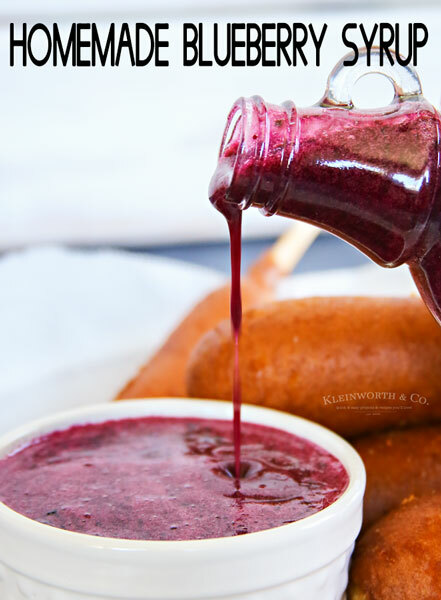 I don’t remember any sort of dipping sauce when I bought my churros growing up. You went to the guy pushing the cart & that was all you got. 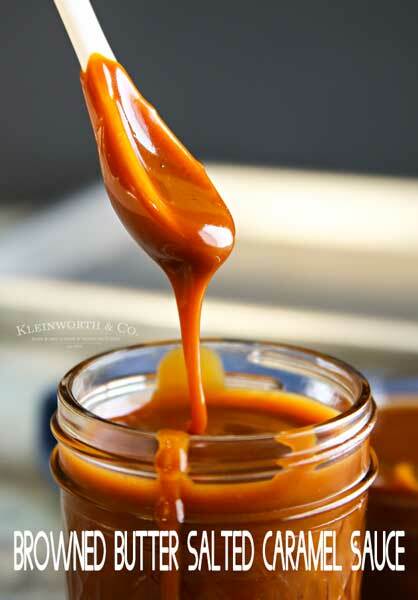 Add a little Dulce de Leche for some, Toasted Coconut Hot Fudge, Triple Berry Sauce, Peanut Butter Sauce & Mocha Dulce de Leche. Each one was great with these churros. 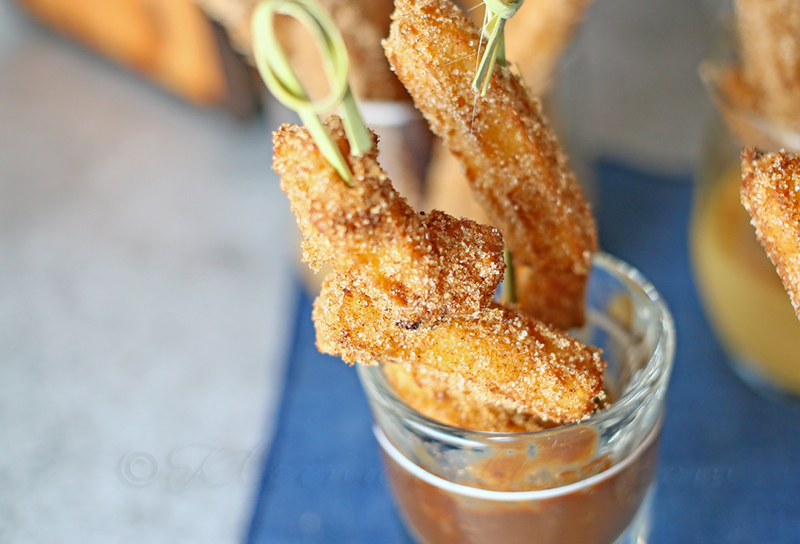 Try these dipping sauces I used with these churros! Heat 1-1/2 inches of oil in a large pot over medium heat to 360 degrees (Watch this closely - through the entire cooking process - important to maintain your temperature). Drain on a wire rack for a couple minutes. I have never had a Churro! Looks SO good! Wow, I didn’t realize you were that close growing up. That is so cool! I grew up close to Busch Gardens and it was such a treat to go every year. I remember not being able to sleep the night before, due to the excitement. I LoVE the churros there, probably very similar to Disney’s. Can’t wait to try your recipe! Thanks for sharing!! Yum! I can taste those now! How fun that you spent so much time at Disneyland growing up. I bet you have volumes of memories. Indeed – it was definitely a huge part of my first 20 years. 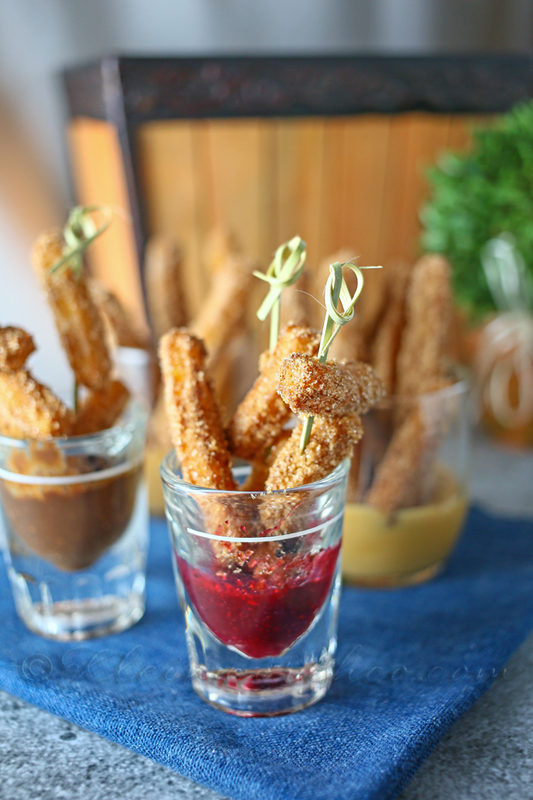 I’ve never had or made a churro, but these look delicious! I’m hunting for things to make with my kids over the summer and this one would be perfect. They look so easy!! Pinning! Oh I sure hope you try them Cindy- they are incredible. These look SO delicious! I’ve never even made a fried doughnut, let along a churro. I think I need to change that 🙂 Pinned! Those look fabulous. Bet they’re even better than the original with the dipping sauce! Those sauces look out of this world! You’ve taken the Disneyland churro to new heights 🙂 I grew up going to Disneyland at least once a year (from San Diego) and still, if I miss a year, I start yearning to go there again. So fun, for kids and kids-at-heart. Thank you Sharon- I certainly miss it. Have not tried these yet, but we are heading to Disney in June! 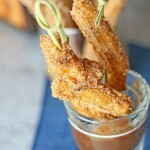 I pinned this-my son loves churros! Wait, where do you live now?? I live in South Bay, so not too far from Disneyland! I hate to say that I haven’t been in six years (hanging my head in shame, ha!) I need to take my boys soon. 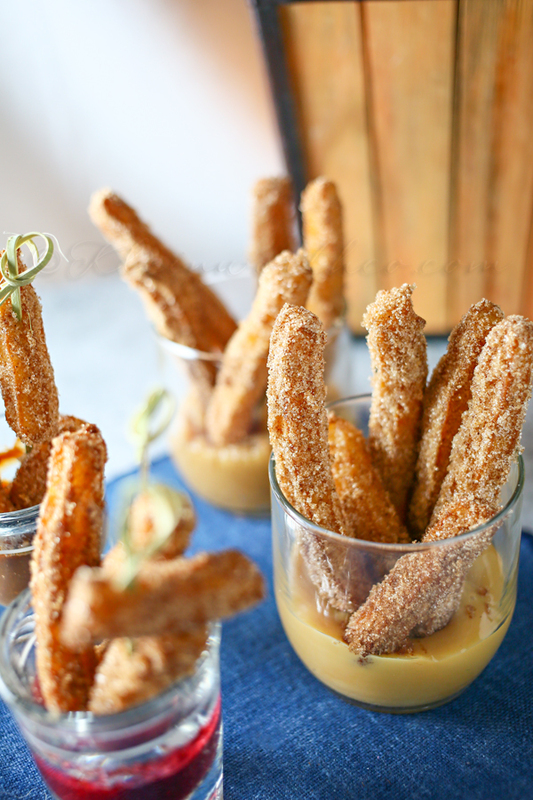 These churros look so good! I love the dipping sauces, too! Great idea, Gina! I’m in North Idaho now-(Coeur d’Alene) so really far from home. 🙁 Maybe we can get together when I make my next trip down. Possibly fall- fingers crossed. Would love to see you!! These look so good, I pinned twice AND stumbled! Looks delicious! Thanks so much for sharing on The Creative Exchange! Thanks for linking with us at Family Fun Friday. Just dropping by to let you know you’re featured this week. The party goes live Thurs at 3:00 Central. I hope you’ll stop by again. 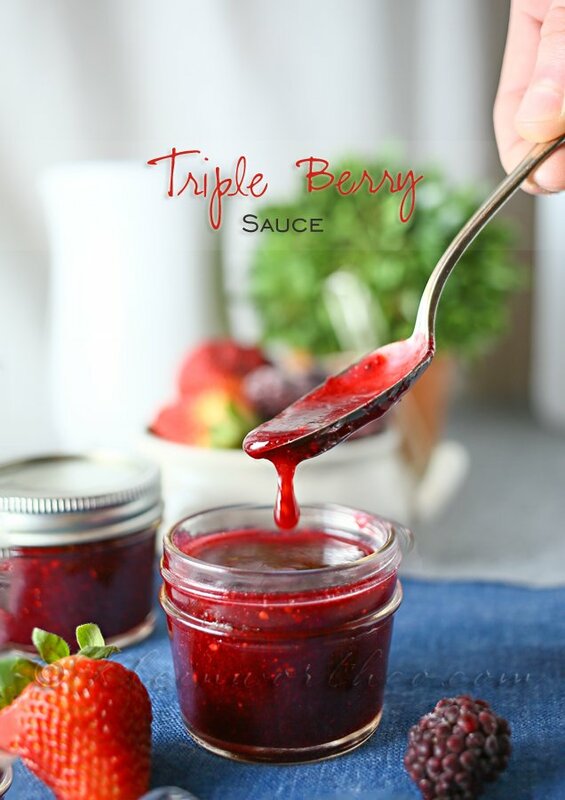 Hi Maria- if you click just under this first image – where it says “Click to continue reading” it will take you to the full post with the recipe. 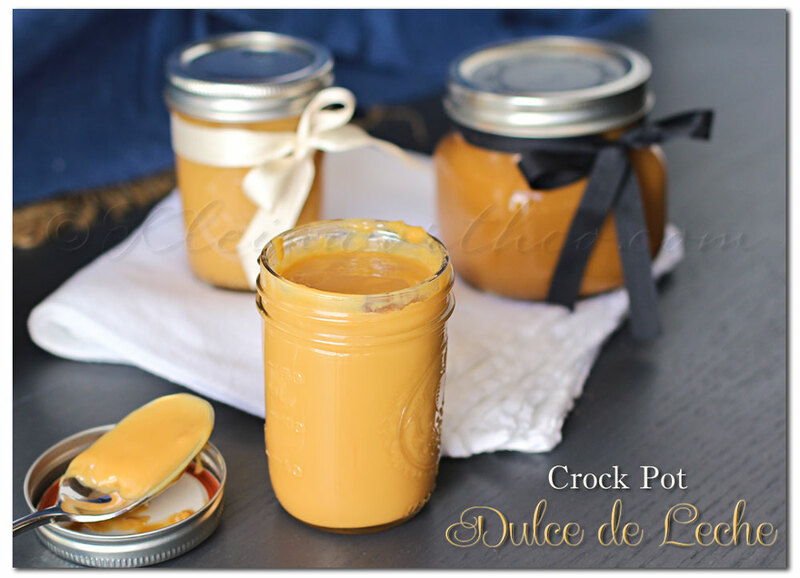 Thanks so much for sharing your childhood memories and this delish recipe with us! My children will loves these!